The best beginner's method available for uke. Written in C tuning, it contains chords, strum patterns, and songs in various keys and styles. 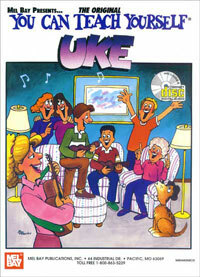 A special feature is the inclusion of many great uke favorites like Peg O' My Heart; Moonlight Bay; By the Light of the Silvery Moon; Chinatown; Alabama Jubilee; and more. Includes audio & video downloads online.